Despite objection from over 15,000 people, South Lanarkshire Council has approved the extension of Hyndford Quarry, near World Heritage Site, New Lanark. Many local groups were against the extension, as well as local and national politicians. A website was set up by objectors which can be seen here called Save our Landscapes. New Lanark was once a thriving industrial centre where adults and children had good working and living conditions, thanks to the philanthropist, Robert Owen. 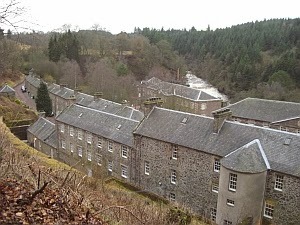 While many people in the 19th century lived and worked in terrible conditions, those in New Lanark had good working conditions, housing, access to education and health. Physical punishment was prohibited and child labour was restricted at a time when children worked down mines and in other dangerous places. 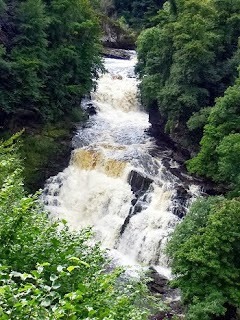 The magnificent Falls of the Clyde are also in the area, with Corra Linn Falls being described by the poet William Wordsworth as “the Clyde’s most majestic daughter” after a visit in 1802. JMW Turner painted the Falls between 1844 and 1846 and Sir Walter Scott and Samuel Taylor Coleridge were also visitors to the area. The site became a UNESCO World Heritage Site 12 years ago and a previous First Scottish Minister, the late Donald Dewar, gave assurances that the site would be protected. Historic Scotland also agreed to protect the site. Pressure is now mounting for the Scottish Government to reject the planning extension by Mexican company Cemex. Hopefully the final outcome will be known soon.